AEPS has produced a number of publications and bulk-buys philatelic materials for sale to members. It also holds stocks of items published by member societies or individuals on a commission or sale-or-return basis. 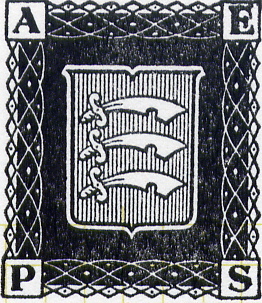 The proceeds from these sales help provide the funds necessary to enable AEPS to fulfil its objectives to promote the hobby of philately in Essex. Note: These prices are correct at time of going to press. Actual prices are subject to adjustment as new stocks are purchased. AEPS Sales items are available on the AEPS Sales table at AEPS Council meetings, AEPS Stamp Days and Autumn Rallies, or by post. Items marked * can be obtained from Mr How. All other items can be obtained from Mr Stanway. Three volumes available by email free on request.Contains details of present rules and guidance, past history and a catalogue of philatelic souvenirs issued since 1944. AEPS History by R D Lee (1986). A brief illustrated history of the first 40 years of the AEPS. 16-page paperback. ISBN 978-0-9511700-1-4. £2.00 each (P&P £2). Mails Under London by L C Stanway (2000). The history of the carriage of mails by rail under the streets of London by the Pneumatic Despatch Company, the Post Office Railway and by the London Underground companies. Includes details of stamps and other philatelic material. 56 pages, 17 plates, line diagrams of rolling stock. Paperback ISBN 978-0-9535398-1-9. £9.50 (P&P £3). Album page covers. Venus Protectors Light Duty Plastic. 290mm x 275mm (50 covers). Storage boxes. Stout cardboard. 330mm x 320mm x 75mm. Other items listed in the catalogue (sections H1-H2) may be obtainable on request. The AEPS will be pleased to accept covers, etc., from events run by member societies for sale on their behalf on the AEPS table as above, either as a donation or on a sale or return basis. No commission will be charged. Donations of any material for sale for AEPS funds would also be welcome.